A team that functions well gets optimal results. A team, however, is made up of individuals who bring their unique set of characteristics to the team. Often, the diversity of personalities, values, and experiences can create friction within the team. This one-day team-building experience will maximise each individual’s ability and willingness to contribute to the team and its purpose. 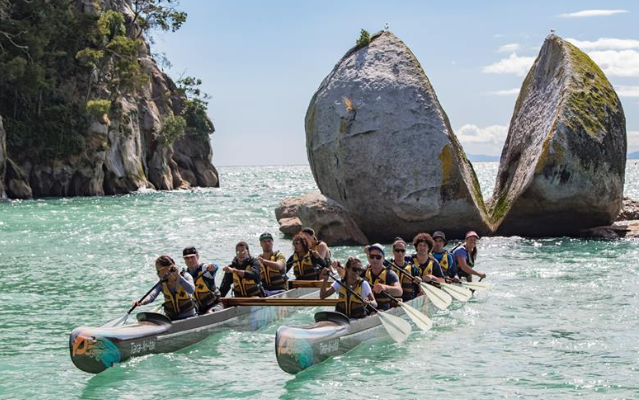 The day starts at 8am at Kaiteriteri beach with a 2-hour Waka Abel Tasman experience, enjoying New Zealand’s treasured heritage. Paddling as a unit in the double-hulled ‘waka tuarua’ the crew has to pull together and communicate. Watch fresh air, exercise and co-operation work their wonders. It is then back to the Kaiteriteri conference room facility for the rest of the day. What a start! The day will be structured around activities that highlight theories and ideas from the group and the facilitators. New learning is put straight into action! Follow-up sessions focussing on goals and plans made for better results will be held at short intervals after the team-building day. This is designed to ensure the team stays on track and that the skills gained from the day are embedded through practice and reflection. Whilst designed to improve the skills of individuals this team building experience can be tailored to a specific team within your organisation. Costs is $459 + GST per person, with a minimum number of 10 participants. This number is based on participants from multiple companies. If you would like a quote for your company only, please contact us.